It's hard to believe that it's been already three weeks into this new expansion. During this time, I've managed to complete enough of the questing to open up world quests. I've gone back to finish the Drustvar quest chain to completion, having killed the end-boss. Now on to Stormsong and Tiragarde. The contract is coming in fairly nicely. I've been running with the Order of Ember's contract (note they don't expire, so don't buy hundreds of them like I did). I get 10 rep with each and every world quest (i think only in kul tiras, not zandalar wq). So on some quests completion, I am getting three different reps (tortollan, storms watch and order of embers). At the moment, I am 85% of the way through honored to revered with the faction. This is after completing this zone, and two emissary boxes, plus running a contract since hitting 120. I'll probably change to a 7th Legion contract soon (after revered with OoE) as the 7th Legion rep gates other content. Like many suggested, I did run the first week and half in warmode. This was rather painless and didn't require that much world pvp. A nice perk for simply playing on a pvp shard. Last week, while questing in Stormsong though, I had to disable the option. Kul Tiras isn't that big of a pvp server. So there were small groups of horde roaming Kul Tiras zones just killing everyone, with no real alliance resistance to keep them at bay. Since then, I've turned off warmode on my hunter. It IS really nice to run the Crusaders of Azeroth world quests and not have to worry about fighting horde toons. I've tamed myself a bee hunter pet. Named him Beehave. I've tamed a battle pet, named her Beelieve (per my daughter's suggestion). Last night, I spent about an hour at the xmog ethereal and started working on a yellow and black transmog. ( I am torn between these shoulders I picked up this morning and ones I had in my bags that have a yellow horn on them). This is still a work in progress. The horde troll attire does fit the golden them fairly well. Finish questing in the remaining 2 zones. World quest/emissary boxes to keep increasing reputation. Increase gear score by 1 more point (to 305) so that I can start running random Heroic dungeons. My guildie mentioned that we could 'walk-on' to a few heroic dungeons, but would need a full group. Maybe a few more normal dungeons to replace these <300 trinkets?? Normal Uldir should open on this coming Tuesday. I'd like to be at least 315 by then, hoping to get a lot better gear by then. Start all over again with my warlock on horde side. He's still parked in Orgrimmar waiting to explore any new zones. I'd highly recommend you use Champion of Azeroth contract instead. 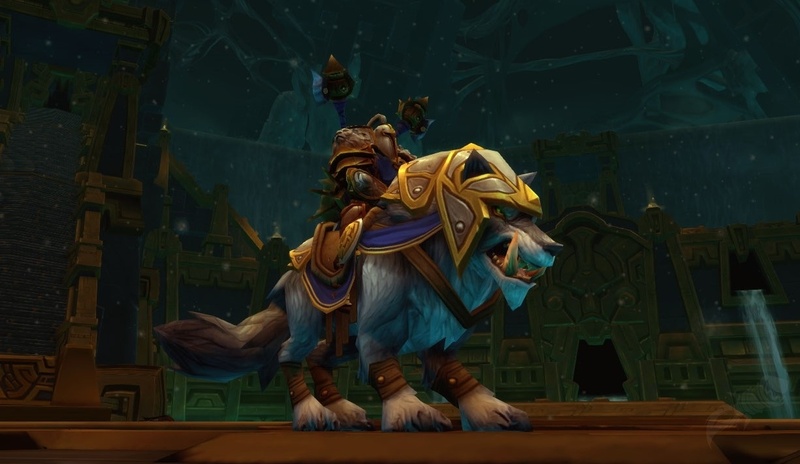 It's not too hard to grind out any of your own faction rep, but it's a pain to do Champion as only their WQ gives you rep. And there aren't that many of them. I've currently concentrating on grinding out 7th Legion (I'm Alliance) to get the Dark Iron.